I owe it to a college roommate to make this recipe. He loved gnocchi and would order them in any Italian restaurant that he could. When I went to Italy, I was determined to try them but, for whatever reason, I didn’t like the ones that I had. In retrospect, I don’t think it was the gnocchi that I disliked. But I did send him an email with my conclusion and he was incredulous. I figured gnocchi deserved another chance. And, while I hate admitting I’m wrong, I was and my roommate was right. Gnocchi are good. They remind me most of dumplings. I like the lightness and fluffiness of them. They also seem to be the ultimate poor food. When you can’t afford flour for pasta, you have to substitute potatoes. But, given that they’re good, who am I to complain? There are a number of possible sauces to use with the gnocchi but I settled on a simple tomato sauce. This one is particularly good (and easy). Put the potatoes in a large pot and cover with water. Bring to a boil, reduce the heat to a low boil, and boil for 45 minutes or until the potatoes are tender. Drain the potatoes. Peel the potatoes and then run them through a food mill onto a flat work surface. Make a well in the center of the potatoes and sprinkle the potatoes with the flour. Add the egg and salt to the well in the potatoes.. Use a fork to slightly beat the egg. Using the fork, slowly incorporate the potato into the egg. Once the potato is fully incorporated into the egg, knead the dough until it forms a ball. Continue kneading for 4 minutes. Divide the dough into sixths. Roll each piece of dough into a rope 3/4″ in diameter. Cut the rope into 1″ lengths. Roll each piece down the back of a fork to create the ridges. Boil the gnocchi in copious salted water until the float, about 1 minute. Drain the gnocchi. Toss the gnocchi with warmed sauce and serve. I think innovatel is trying to say that he hasn’t eaten in awhile so the post made him hungry. I love gnocchi, and yours looks especially good! My boyfriend loves gnocchi and I feel the same way you did (never liked them!) but maybe I’ll give it another chance too and make this recipe for him sometime. Thanks for this post! I love gnocchi, but I can never make them right. I will definetly try your recipe. Brad – Thanks for the kind words. Hillary – You should really try to make them for your boyfriend. These would be hard to dislike and, at worst, you can just save some of the sauce and toss it with spaghetti. You’ll also have a gracious boyfriend then. 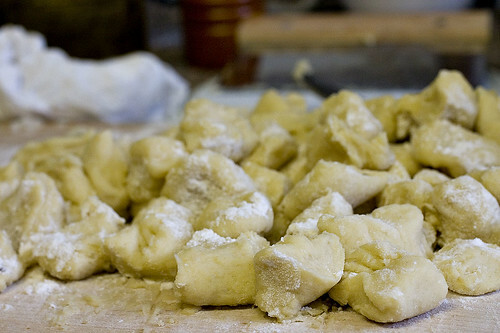 Di – These were pretty simple to make but I can’t really compare them to other gnocchi as I haven’t had many. I’m not sure if these are “authentic” or not but they tasted good. Cyn, I hope you enjoy them and good luck. Tell me how they turn out. And don’t forget the linked marinara sauce. It’s great with the gnocchi (or pasta really). innovatel – Don’t worry about it. Your English is better than my Italian. I have never heard of gnocchi with choux pastry but it does look good. I’ve added to my ever growing list of things to try. I may have to substitute something for the Gorgonzola as my wife doesn’t like it but I’m sure I can figure something out. you have ever tried cavatelli of Basilicata? palmariello – Perhaps I misunderstand but cavatelli are more of a pasta than a gnocchi, no? I’m not sure what you’re trying to suggest.